A well-known novelist and journalist from the coastal city of Jableh, Samar Yazbek witnessed the beginning four months of the uprising first-hand and actively participated in a variety of public actions and budding social movements. Throughout this period she kept a diary of personal reflections on, and observations of, this historic time. Because of the outspoken views she published in print and online, Yazbek quickly attracted the attention and fury of the regime, vicious rumours started to spread about her disloyalty to the homeland and the Alawite community to which she belongs. 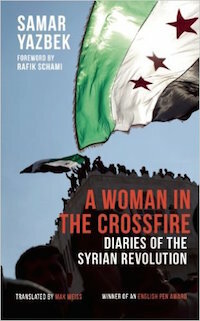 The lyrical narrative describes her struggle to protect herself and her young daughter, even as her activism propels her into a horrifying labyrinth of insecurity after she is forced into living on the run and detained multiple times, excluded from the Alawite community and renounced by her family, her hometown and even her childhood friends. With rare empathy and journalistic prowess Samar Yazbek compiled oral testimonies from ordinary Syrians all over the country. Filled with snapshots of exhilarating hope and horrifying atrocities, she offers us a wholly unique perspective on the Syrian uprising. Hers is a modest yet powerful testament to the strength and commitment of countless unnamed Syrians who have united to fight for their freedom. These diaries will inspire all those who read them, and challenge the world to look anew at the trials and tribulations of the Syrian uprising.